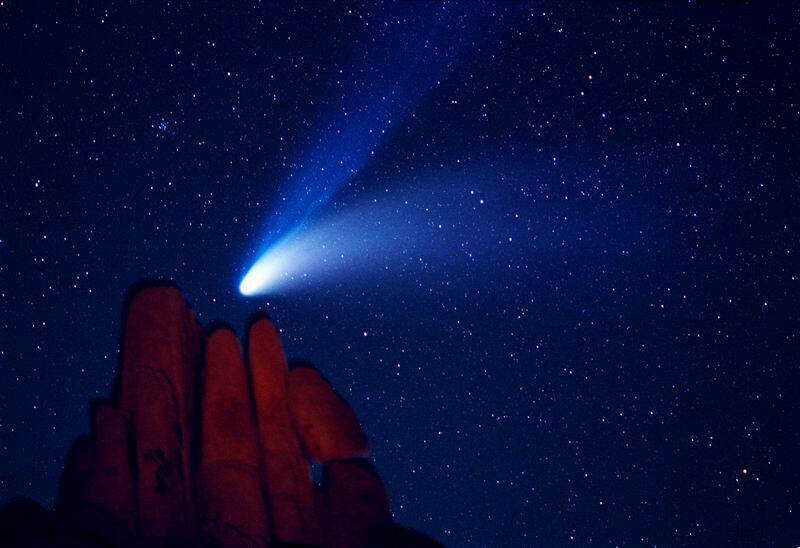 Explanation: Comet Hale-Bopp, the Great Comet of 1997, was quite a sight. In the above photograph taken on 1997 April 6, Comet Hale-Bopp was imaged from the Indian Cove Campground in the Joshua Tree National Park in California, USA. A flashlight was used to momentarily illuminate foreground rocks in this six minute exposure. An impressive blue ion tail was visible above a sunlight-reflecting white dust tail. Comet Hale-Bopp remained visible to the unaided eye for over a year before returning to the outer Solar System and fading. As Comet ISON approaches the Sun this week, sky enthusiasts around the Earth are waiting to see if its tails will become even more spectacular than those displayed by Comet Hale-Bopp.